I love the month of May. I love the month's weather. I love the month's tv season and series finales. I love the dawning of summer. I especially love baseball games in May (although baseball games in October are so much sweeter). I mostly love the month of May for liturgical reasons. May is when Protestants, even Presbyterians, talk about the Holy Spirit. 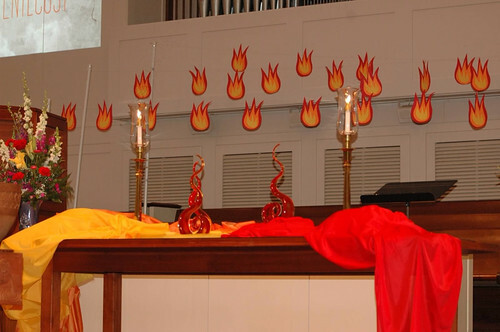 We shed off our resistance and anxiety, embracing Pentecost and all related biblical texts, theological content, and sacred decor that captures the Christian imagination. While the other eleven months our attention is fixed on the Father, Son, and whatever thematic element we deem relevant to our context, May is the Holy Spirit's month. And this year I have particularly longed for and enjoyed lingering in the Spirit's presence. While the Holy Spirit cannot be fully explained or contained, it's mystery partially responsible for our anxiety, she must be confessed by Christians with the same fervor associated with the Father and the Son. The Spirit is the very presence, breath, wind, ruach, pneuma of God that is sent to dwell within God's people, sending disciples of Jesus near and far to be God's agents of love, grace, and mission in the world. The Spirit gifts and equips us for the work of Jesus until he comes again and makes all things new and right. 12 1-3 What I want to talk about now is the various ways God’s Spirit gets worked into our lives. This is complex and often misunderstood, but I want you to be informed and knowledgeable...4-11 God’s various gifts are handed out everywhere; but they all originate in God’s Spirit. God’s various ministries are carried out everywhere; but they all originate in God’s Spirit. God’s various expressions of power are in action everywhere; but God himself is behind it all. Each person is given something to do that shows who God is: Everyone gets in on it, everyone benefits. All kinds of things are handed out by the Spirit, and to all kinds of people! The variety is wonderful..."
The past few week's, in light of Penetecost, I have been encouraging youth to discover their "spiritual"* giftedness. Where and how has the Holy Spirit been breathed into their lives as an invitation to use their gifts, talents, and resources to live into God's dreams for the world? What does it mean to pray for the Holy Spirit to aid us as we take risks and seek to love and serve alongside our neighbors? How can we begin to see our abilities and passions not as means for self-leveraging, but for other-regarding opportunities of hospitality and generosity? What do we believe to be our gifts, talents, and passions? What do others see as evidence of the the Spirit at work in our lives? I have consulted a few blogposts, reflected on the writings of others, and crafted simple resources for youth to dicover their giftedness as provoked by the Holy Spirit. Here are a few helpful links and musings from resources and writers I deeply value. "Listening God, you invite us to pray, to call on you and change our world. How bored you must be with our sometimes safe and harmless prayers. Saturate our lives with the Holy Spirit so that we know what to pray, who to pray for, and how best to pray. Holy Spirit, shake up the ways we pray, quickening our hearts and expanding our expectations so that we may live our faith more boldly. Amen." "A primary purpose of the Church is to help us discover and develop our gifts and, in the face of our fears, to hold us accountable for them so that we can enter into the joy of creating. The major obligation of the Church to children is to enjoy them and to listen to them so that each can grow according to the design which is written into the being of each and emerges only under the care and warmth of another." "Grace certainly does not live and move abstractly, nor transcendently; it comes to meet us in life, in the efforts, hopes, insights, concerns of those about me, in whose company I stand before God...Humility in abstracto can be the grossest pride." *I struggle with the phrase "spiritual gifts" because it makes it seem that the work of the Spirit is abstract. Yet in reality, the Spirit's work is deeply tangible, coming alive in real persons and real activities of the faithful. I prefer to say, "gifts or works of the Spirit." See the Barth quote above as evidence.